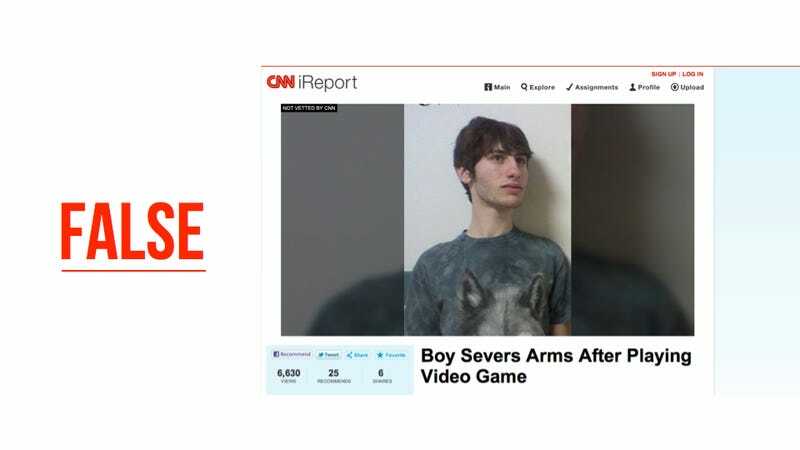 "Boy Severs Arms After Playing Video Game" read the headline of a story that ran on CNN's iReport site earlier this morning. It's the stuff of nightmares for video game advocates, another chance for those who demonize games' effects on human behavior to crucify the medium. But, here's the problem with unscreened crowd-sourced news, which is what iReport is: sometimes, you wind up with complete and utter nonsense. Dunham's friend (name withheld by request) used a large woodcutting axe to deliver the blows and intended to sever both arms but panicked and called an ambulance after nearly severing Ryan's right arm. Ryan had knocked himself out by consuming a large quantity of alcohol earlier in the night, but he left a message on his computer explaining the reasons behind his choice and telling his parents that his friend was not to blame. The message was also posted on social networking websites Reddit and 4chan. Several Reddit users tried to raise the alarm and alert authorities but it was too late. Paramedics rushed Dunham to Brantford General Hospital but were unable to re-attach the partially severed arm and were forced to amputate it. A local police spokesperson said they are looking into the incident but does not expect they will file charges. The game's real and Kotaku's reported on it several times. This report, though, appears to be fake. Navigating over to the Global Daily brings readers to SkipHopz, a click-bait site filled with other spurious headlines where Seinfeld star Jason Alexander is supposedly dead, former teen pop star Zac Hanson supposedly purchased a swimming pool full of cocaine and reality show curiosity Tila Tequila was supposedly strangled by komodo dragons. In other gaming news, they've written that Valve's Gabe Newell was dead last December. Right. As of this writing, the iReport's been pulled from CNN. Based on the sourcing, it looks like the bogus sensationalist piece should never have run in the first place.